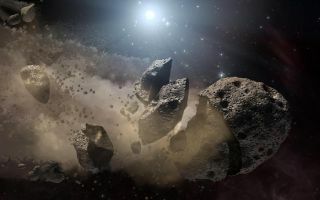 In this space wallpaper, scientists think that a giant asteroid, which broke up long ago in the main asteroid belt between Mars and Jupiter, eventually made its way to Earth and led to the extinction of the dinosaurs. Data from NASA's WISE mission likely rules out the leading suspect, a member of a family of asteroids called Baptistina, so the search for the origins of the dinosaur-killing asteroid goes on. This artist's concept shows a broken-up asteroid.